As the uncertainty over their future remains, Libyans continue filling the streets to try and overthrow Colonel Gaddafi. But after weeks of fighting and bloodshed, many are lost as to how to achieve that. And the lack of control in the country could have devastating long-term effects. On Thursday Russia has imposed an arms embargo against Gaddafi's regime, banning the export as well as the sale, delivery and transfer of all types of arms and related materials to Libya, including weapons and ammunition, combat vehicles and military hardware. 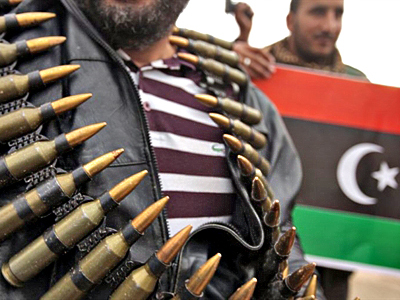 After the liberation chants, the rattle of Kalashnikovs is the most common sound in Benghazi. Ever since rebels seized weapons depots in eastern Libya, rifles have become the ultimate symbol of masculinity that every young man in this city wants. One thing in common between Muammar Gaddafi and the forces struggling to unseat him is a fascination with arms. The Libyan leader has a long-held passion for Kalashnikov rifles – so much so that he had an AK-47 munitions plant built in the country. The rounds this plant produced are now falling all around eastern Libya, on the frontline and beyond. 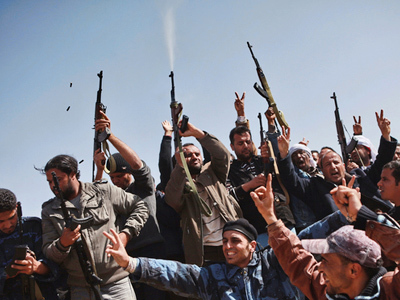 Young men with rifles have become a fixture on the streets of Benghazi. They are eager to show them off and often slap-dash in their handling of the arms. Hamza Urfalli, a soldier from the Benghazi garrison who joined the uprising, says many of his fellow rebels do not have any experience with arms, which he says is compensated by their passionate determination. “We'll fight till the last bullet, till the last drop of blood. God is on our side,” Urfalli says. 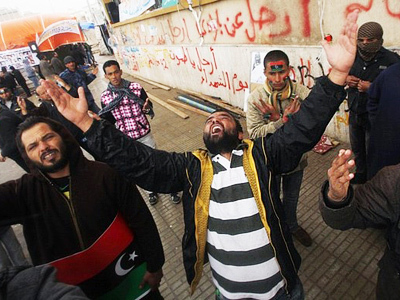 The city of Benghazi is still living off the revolutionary fever. 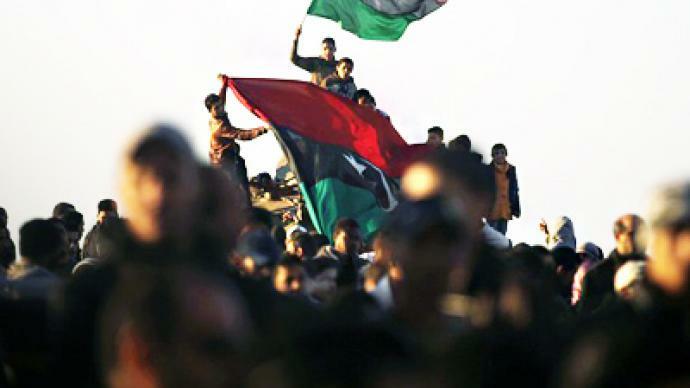 From dusk till dawn, people congregate on the city's main square, calling for Gaddafi to go. Most of the factories are still closed. The only people still working are shop owners and public servants like traffic police officers. 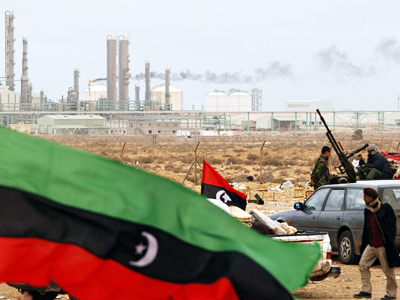 Despite the loss of control over eastern Libya, the Gaddafi government continues to pay salaries to those employed by the state. “Yes, I received my last pay check about ten days ago, but there is nothing to thank Gaddafi for. My salary is just 450 dinars – with that I can barely support my family,” said one of those Libyans working for the state. The agitation and uncertainty of the last few weeks is already exerting its toll on public health. Benghazi’s psychiatric hospital is now flooded with patients whose pre-existing conditions have been exacerbated by the unrest. “Nowadays because of the people’s uprisings a lot of people are suffering from the so-called panic disorders. Some of our patients are also having relapses from their previous mental problems,” says Ali Elroey from Benghazi Psychiatric Hospital. 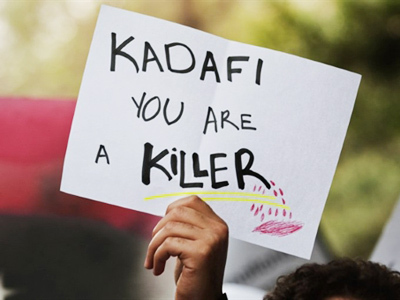 Hated and ridiculed, Gaddafi may be the most valuable asset for the opposition movement as that hatred pulls people together. For the time being, it unites those who spent years serving in his government and the victims of his persecution. Yet, their chants for free Libya are yet to be augmented by a clear vision of how to achieve it. “It is very hard to try to determine who could be the real charismatic leader of the really strong structure that could come on the ground, who could say, ‘Well, I am well-known by the Libyans, I have a program, I have some horizons and I will be able to achieve or to be the alternative that will gain or that will help achieving better perspectives and the better horizons in Libya,’” says Middle East expert Mikhail Barah. People in Benghazi are now living off their savings, sharing what little they have. Most of them are confident that, once Gaddafi leaves, the bright future will dawn on them. But if past revolutions are anything to go by, the abundance of arms and hordes of idly roaming men could mean exactly the opposite.